This needlepoint Schnauzer eyeglass case is ideal for holding your sunglasses or cellphone. A very unique Schnauzer gift! 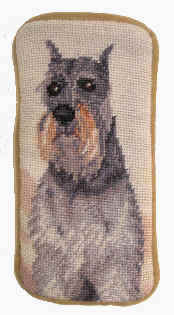 Elegant Dog Gifts, Including a Needlepoint Schnauzer Eyeglass Case. The Ultimate Online Shopping Mall for Dog Merchandise and Schnauzer Gifts.